Pour into a greased and floured 10-in. tube pan. Bake at 350° for 65-70 minutes or until a toothpick inserted in center comes out clean. Cool 10 minutes. Run a knife around edges and center tube of pan. Invert cake onto a wire rack over waxed paper. 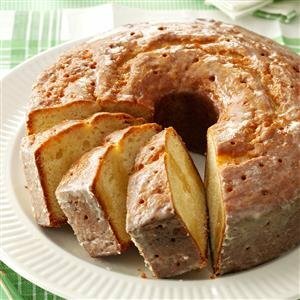 Poke holes in the top of the warm cake; spoon 1/4 cup sauce over cake. Let stand until sauce is absorbed. Repeat twice. Poke holes into sides of cake; brush remaining sauce over sides. Cool completely. Makes 16 servings.